Respicare is a product which is meant to increase the immunity of the lungs. It dilates the air pipes, so that air can flow without any obstruction. It also acts as an expectorant. AZ Respicare capsules are used when an individual may suffer from problem such as productive and dry cough, bronchial asthama, cough in respiratory tract and cough in nose. 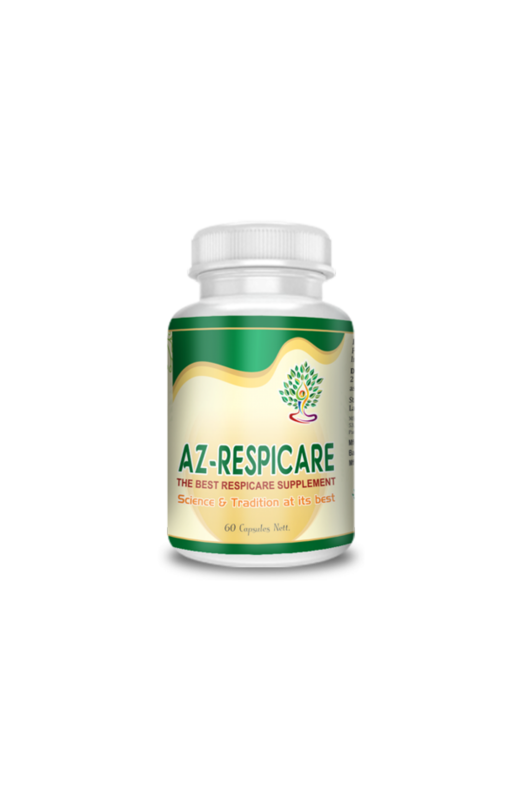 AZ Respicare is beneficial in both productive and dry cough. The mucolytic and expectorant properties reduce the viscosity of bronchial secretions and facilitate expectoration. Choti Kantkari (Solanum Surrattens) - Roots and seeds are used as an expectorant in asthma, cough and pain in chest. The decoction of the root is given with honey, to treat cough. Vasa (Ashatoda vasica) - In condition of acute bronchitis, the juice of leaves of vasa gives good results. It helps in easy urination and is useful in spleen related disorders. Tulsi Pater (Ocimum sanctum) - It has antibiotic, anti-viral, anti-bacterial and anti-carcinogenic properties. It is also beneficial in treating respiratory ailments like chronic bronchitis, asthma et cetera. Muethi (Glycyrrhiza glabra) - It even loosens and thins mucus in airways, which eases congestion and coughing. Bharangi (Clerodendrum serratum) - Since bharangi is snigdha and madhura, it acts as an expectorant. It is therefore useful in cough and hoarseness of voice. Mixture of bharangi root juice and ginger juice is given in asthma to reduce the attacks of dyspnoea. Shud vatsnav (Aconitum ferox ) - It is used in Ayurvedic treatment of indigestion, anorexia, spleen disorders, gout, cough, asthma. Giiloy Satav (Tinospora cordifolia) - Survival time was increased after irradiation, and body weight loss was decreased in mice pretreated with a single dose of tinospora extract. Sonth (Zinziber officinale) - Dry ginger powder can be added to milk and sugar to get rid of urinary infections. Kali mirch (Piper nigrum) - The spice of black pepper would be of great use in case you are suffering from regular bouts of cough, for both productive as well as non-productive cough. Magh papal (Piper longum) - In a developing country like India, where lack of sanitation and cleanliness forms an important reason for many bacterial infections. Dhatura (Datura metel) - It has been used by the British soldiers to treat respiratory problems. Both scopolamine and atropine are used as sedatives and sometimes helps in curing of motion sickness, nausea and dizziness. Tavakshir (Bambusa arundinacea) - A decoction of the shoots of the plant in combination with honey is very helpful in relieving respiratory problems. The leaves may also be ingested directly for the purpose of killing worms in the stomach. Jaiphal (Myristica fragrans) - The key compound present in nutmeg is myristicin, which inhibits the action of an enzyme that is responsible for alzheimer’s disease. It also stimulates your brain thereby easing mental stress, in addition to improving your memory. Javitari (Myristica fragrans) - Nutmeg and mace spice contain many plant-derived chemical compounds that are known to have been anti-oxidant, disease preventing, and health promoting properties. Choti elachi (Eltttaria cardamomum) - If you have bad breath and have tried every sort of remedy out there, give elaichi a try. The spice is packed with antibacterial properties, in addition to having a strong flavour and a pleasant smell. Lavang (Syzygium aromaticum) - With anti-inflammatory properties and cooling effects present in cloves, coughs and colds can easily be cured. Simply chewing or gargling cloves helps in easing sore throat. What’s more, they are used for treating respiratory disorders, like bronchitis, tuberculosis, asthma and sinusitis. Tejpater (Cinnamomum zeylanicum) - Bay leaves contain notable plant-derived compounds, vitamins and minerals which offer a range of benefits. This herb was widely used by the Greeks and Romans who believed that it symbolizes wisdom, peace and protection. Dalchini (Cinnamomum zeylanicum) - Cinnamon helps combat bad breath. Chewing on few cinnamon sticks or gargling with warm cinnamon water helps to get rid of bad breath effectively. Tankan bhasam - It is used in the treatment of productive cough, bronchitis, wheezing, asthma, chest congestion. Shankh Bhasam - It is useful in the treatment of gastritis, abdominal colic, malabsorption syndrome, dyspepsia, vomiting, nausea, acne, etc. Godanti bhasam - It is used in the treatment of leucorrhoea, fever due to pitta imbalance, Chronic fever, cough, cold, asthma, anemia, chest injury, emaciation and wasting in children. It improves strength and immunity. It is used in the treatment of migraine. Prabal pushti - It is used in the treatment of cough, cold excessive burning sensation.